On a Sunday — always with butter. Sunday and Monday are my days off. The days I do all the baking for the blog, photos whatever I created; trying to cram as much in to the day as I can. So here is what I made Sunday. Roasted Brussels sprouts. A hated vegetable to most, but throw in the cranberries and pecans, and it's love. The Brussels Sprouts get a crunchy layer on the outer leaves and the centers are soft, while have soaked in the tang of the balsamic. 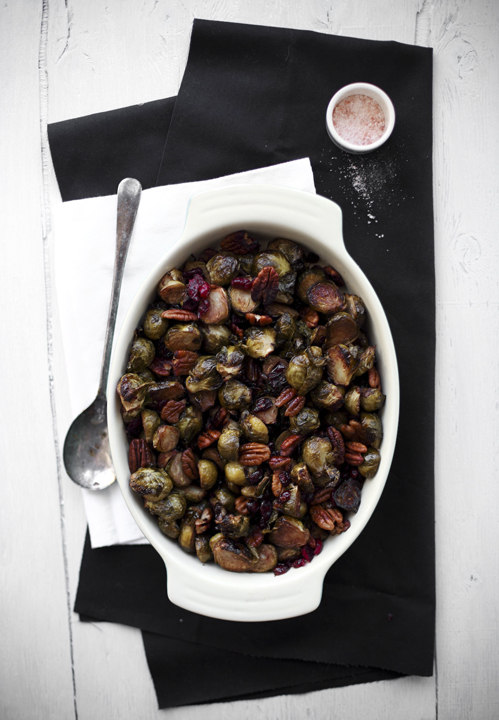 A sweet and savory combination, the cranberries dried get all chewy from being roasted and the pecans have the crunch. I want to try this with fresh cranberries since they are everywhere at the market now. They were a big hit with my dad too, I have already made them twice this week. On to the truffles. Tea leaves in baked goods, that is my obsession of the moment. The chamomile goes very well with the rich, thick ganache of the truffles. Surprising not overpowered by all the chocolate. When you keep them in the fridge, it's like having little balls of magical fudge right at your finger tips. When you leave them out, they are soft with that melt in your mouth, get all over your fingers appeal. Two very simple recipes but with amazing results. Thanks everyone for the loving support about my last blog post. Nerve to hear from such thoughtful readers. Christmas is only days away, finally have the last of my shopping done and am now planning out what to bake for the big day. The weather is cold, my sweaters don't seem to suffice, so baking in my kitchen will be the best way to warm me up. Happy early Christmas! drizzle with olive oil & balsamic. oven, add in pecans & cranberries. Bake for and additional 20 minutes. Serve hot, season again with salt. for a few hours until conpletely set. 1 tea bags worth of chamomile.